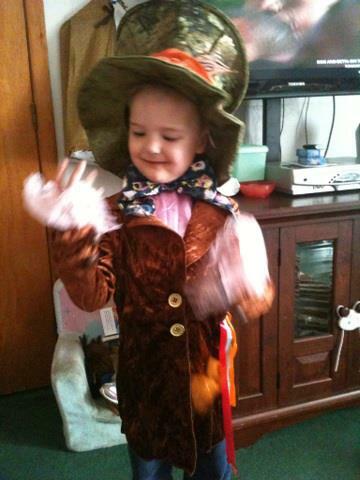 ♥ Mama 2 Multiples ♥: Wholesale Costume Club Review! I have worked with Wholesale Costume Club several times over the past couple of years, and have never, ever been disappointed with the experience I have had with them, and their products. My children even won a costume contest last Halloween with their Thing 1 and Thing 2 costumes I received for review from Wholesale Costume Club! This year, we decided to go with an Alice in Wonderland theme for the children for Halloween. I am SO excited about it this year!! It's going to be perfect for our kiddos! Merasia will be Alice of course, Mason is going to be the Cheshire Cat, Kendall will be the bunny, and Connor is going to be the Mad Hatter. So cute! For my review this time around, we received Connor's costume first! I checked it out as soon as we got it, because I just couldn't wait! I LOVE IT! I knew I wouldn't be disappointed anyway, but it was nice to see just how much I loved it when I opened it up to check it out. 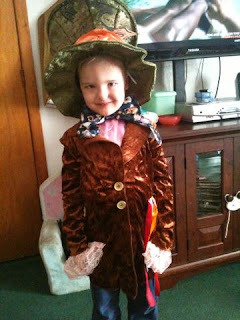 The Mad Hatter costume came with the brown jacket, a shirt front, a big bow tie, and the hat with it's wide orange sash. The quality of the material surprised me in a great way. It's soft, thick, HIGH quality, and just so fancy and deluxe that it's really going to help Connor bring the part of the Mad Hatter to life when Halloween time comes! Of course I couldn't wait to try it on him and see how ridiculously cute he looked either! Of course it's great that I was happy with the costume, but it's even better and even more important that HE is happy with the costume, and enjoys wearing it, and I think it's pretty clear from the photos above that he is beyond satisfied and happy with it! When it's time for you to think about Halloween costumes and accessories for your little ones, don't look anywhere else besides Wholesale Costume Club! While you shop around their website, don't forgot to "like" them on Facebook and follow them on Twitter!